Temporomandibular joint (TMJ) disorders are often caused by a misalignment in your jaws. This improper position can lead to severe and far-reaching issues. Many patients undergo surgical treatment to relieve symptoms. However, these approaches can be extremely invasive, may only treat the side effects, and require significant time for recovery. Dr. Jon Marc Van Slate believes in providing the most conservative care possible. For this reason, he offers non-surgical TMJ treatment at his Houston, TX, office. He aims to relieve the symptoms associated with TMJ disorders (TMD) by gently treating the underlying cause. Non-surgical TMJ treatment approaches are conservative, based on the exact needs of each patient, and are general procedures available without the recovery time needed after surgery. TMD causes jaw disfunction, and it can result in a range of symptoms. In some cases, TMD can occur because the temporomandibular joints themselves are damaged. Often, the cushioning disc inside can slip out of place, leading to discomfort and a popping or clicking sound. In other cases, the structure of the joint may be sound, but the nearby muscles and ligaments become inflamed. Surgical TMJ treatment is very invasive and may only treat the symptoms of the problem. A surgery may seek to remove and replace the displaced jaw disk without treating the cause for the displacement. Surgery can also realign the jaws with irreversible effects that can cause significant damage. The National Institute of Dental and Craniofacial Research advises against undergoing any surgical treatment for TMJ disorders. The vast majority of TMD patients will benefit from non-surgical care. These approaches are conservative, based on the exact needs of each patient, and are general procedures available without the recover time needed after surgery. With progressive treatment, non-surgical methods are able to provide relief for symptoms by treating the underlying cause in stages. 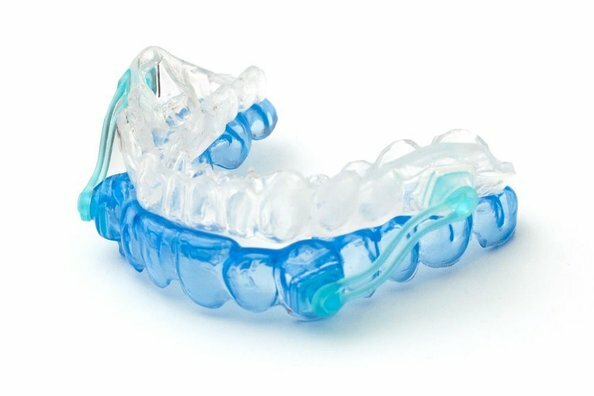 If pain and discomfort are caused by misaligned jaws that place pressure on the joint, an oral appliance can shift jaw alignment for a proper placement that does not stress the joint. Oral appliances can also prevent clenching and grinding of teeth that can both cause and result from TMJ disorders. A computerized mandibular scanner will measure your jaw’s range of motion and the amount of torque placed on it. An electromyography test (EMG) will measure activity in your jaw muscles, sensing inflammation or strain. An electrosonography test will evaluate the state and function of the jaw disk, picking up any popping or clicking that signal displacement. With a detailed knowledge of how your joints work, Dr. Van Slate can design an oral appliance, adapted specifically for your TMJ function. The device, which you will typically need to wear only at night, can reposition your jaw to alleviate pressure on your joints. For qualified patients, non-surgical TMJ treatment can be as effective as more aggressive care – if not more so. Dr. Van Slate can provide an oral appliance that can dramatically relieve the symptoms of TMJ disorders. In addition, unlike with surgical treatment, you will not have to deal with post-operative discomfort, a liquid diet, or an extensive recovery period. Instead, you can enjoy improved oral function, increased physical comfort, and lasting improvement of your oral health that prevents future issues. Non-surgical treatment for TMD is an easy way to improve your overall quality of life. Contact our office to obtain more information and to find out if our oral appliances may be right for you.